In addition to road safety and along the same lines, a huge thing that we focused our attention on and made sure that every child was engaged and interactive with is the enormous responsibility that comes with learning to ride a bike. Think about how excited you were when you were 14 or 15 and getting closer and closer to the day that you reached the age of getting your driver’s license. If you don’t have kids, you might not remember what this feeling is like but let me tell you first hand that this level of excitement for young teenagers is the same sort of emotions and feelings that young children get when they are getting close to the age of learning to ride a bike. 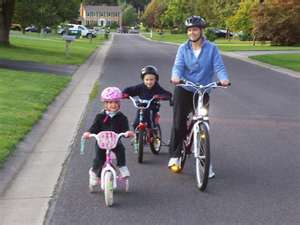 There is a huge responsibility for both parents, and the children, in regards to safety on the road when riding a bike. We actually had official police officers teach this course at the village and they taught certain lessons in ways that the kids could relate to and have fun with, but with a level of seriousness and authority that the kids really understood that this wasn’t something to be taken lightly. It is important to make sure you still keep that innocent excitement alive in your children when talking about bike safety and to not scare them away from the whole concept, but in a way that they know this is a huge responsibility and can be taken away at any time if they aren’t taking it as seriously as they should be.